MIAMI (AP) — The memories will be impossible for Mike Miller to ignore on Saturday. He’ll be back inside AmericanAirlines Arena, where he helped the Miami Heat win the 2012 and 2013 NBA championships. He’ll see the banners and recall his best moments — the one-shoed 3-pointer against San Antonio as part of Miami’s Game 6 comeback in the 2013 NBA Finals, the seven 3s against Oklahoma City in the 2012 title clincher, the way he got mobbed when he returned as a visitor to get his second ring. Then he’ll get to work. Miller is an assistant coach on Penny Hardaway’s staff at Memphis now, and the Tigers (3-3) will take on No. 20 Texas Tech (6-0) as part of the four-game lineup at the HoopHall Miami Invitational. And Miller plans to show off many of the championship reminders scattered around his former home arena to Memphis’ players, hoping they might serve as inspiration. 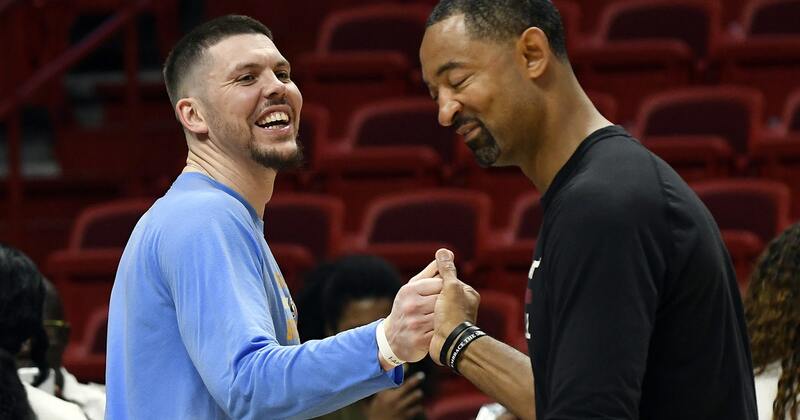 Miller spent three seasons in Miami, helping the Heat reach the NBA Finals in each of those years as he played alongside LeBron James, Chris Bosh, Dwyane Wade and his University of Florida teammate Udonis Haslem. He lasted in the NBA for 17 seasons and is still the only player to win both Rookie of the Year and Sixth Man of the Year. Now he’s teaching the game on a staff with Hardaway — whose last NBA game was in 2007, when he played for Miami. Hardaway appeared in 16 games with the Heat, so Saturday will be a homecoming of sorts for him as well. Miller was a fan favorite in Miami, particularly for how he played through an absurd amount of injuries. His back was almost always balky, to the point where he fully expected that the title-clincher against Oklahoma City in 2012 — the one where he made his first seven 3-point tries — would be his last game before retirement. He snapped one of his thumbs in practice when it got tangled in James’ jersey. He had a bad wrist, bad knees, pulled muscles on more than one occasion while actually making a 3-pointer. “I’ll probably pull a hamstring standing up Saturday,” Miller said. Truth is, he’s healthy and he’s happy, and the Heat aren’t surprised to see him going down the coaching path. Heat coach Erik Spoelstra shared some old playbooks with him this summer. He thinks Miller could coach in the NBA if he desired. The HoopHall event has three other games: St. John’s (6-0) vs. Georgia Tech (4-2); N.C. State (6-1) vs. Vanderbilt (5-1); and Yale (2-2) vs. Miami (5-2).